Okay, it’s not really all that dark. At best, it’s dim, and that’s pushing it. But, in short: The comics you’ve been seeing to date were all, for the most part, compiled for a submission of Odori Park to the newspaper syndicates. I sent out said submission to the major syndicates at the end of 2007, and dutifully filed away each rejection letter as they trickled in through 2008. Despite being rejected all around, I was pleased to see the positive comments several editors shared. In general, it seemed that editors liked Odori Park–going by the title A Book By Its Cover at the time (name of the Eastons’ bookshop, natch)–for its art and writing, but that the concept itself wouldn’t sell well to papers. The reasons were ambiguous, but my take is that either a bi-national family was too left of mainstream for the mass media, or my depiction of what’s essentially a family comedy was too ordinary to stand out. Sort of an odd conundrum. Through 2008 I worked on some additional Odori Park strips, and then put together a second submission package around a new concept. (Maybe someday I’ll share that, too, if the world is curious.) But the reception from the syndicate letters and from friends was positive enough that I decided to take Odori Park online. Posts starting tomorrow are truly new. Enjoy! And if you have an opinion as to whether Odori Park would have done well in the funny pages, I’d love to hear it. I have plenty more thoughts about productivity, mindfulness, and creative flow, so if you have a read and enjoy the piece, please let me know–or better yet, add your thoughts to the conversation–and I may do a follow-up article. I mentioned a couple blog posts ago that I’m teaching a series of workshops and classes at the Hopkinton Center for the Arts (here in Boston’s metro west region) in November and December. The time for the eight-week Cartooning & Comics class is getting close, so I wanted to toss out a reminder that if you are, or have, a child between grades 4 and 8, please pop over to the Center website and sign up for the class. I’d love to see tons of shining faces there, ready to draw! Come learn how to put the exciting ideas in your head on paper. We’ll start with how to draw fun cartoon characters and the worlds they live in using techniques like building figures up out of basic shapes, and making drawings that look 3D with foreshortening and simple perspective tricks. We’ll explore what makes a great character design by looking at how our favorite characters are made, and we’ll learn how to create mood and emotion with facial expressions and body language. 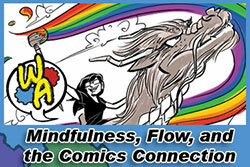 At the close of the class, we’ll dip into telling stories with pictures by making comic strips and a mini-comic book. Over the holiday break, I mentioned that I’d gotten my hands on a Windows Surface Pro 2, and was putting it through its paces. Folks interested in digital art-making may have read other thoughts on the topic already. The bit that I’d read had me excited enough to jump at the chance to try one out. 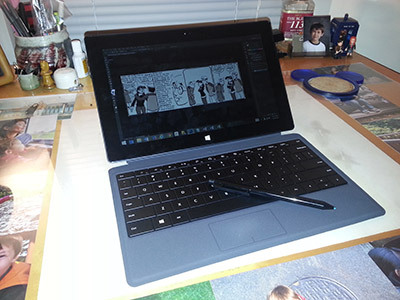 I’ve had the Surface for about three weeks now, and I’ve used it to draw two full comic strips, in addition to using it extensively for browsing, emailing, scheduling, and tackling other day to day tasks. All in all, then, although I’m still a newbie, I’ve exercised it enough to have some strong opinions. Take them with the grains of salt they are due. Know that my complaints (and kudos) are not entirely with the Surface itself, but with how well it integrates into my preferred way of comicking and computing. There are as many obstacles due to learning curve, preference, and uncooperative third-party vendors as there are due to Microsoft’s design and implementation. One last thing to know: In my day job, I’m a user experience design professional, which may give you context for some of my comments and gripes. The overall user experience of the device is kludgy, like multiple teams were responsible for parts of the interface and they didn’t always communicate. The core of the operating system experience is a fairly standard Windows desktop computer, with a couple layers of “tablet-ness” stacked on top. Your Start menu, for example, is touch-oriented, but once you get into the majority of applications, you’re dealing with tiny hit areas and desktop-based metaphors and interactions. Behaviors aren’t always consistent or logical. Some apps and shortcuts can be “pinned” to your taskbar, some to your Start screen, and some to both, but I haven’t yet figured out the pattern behind the differences. They’re all icons to the user. I’ll accept that Windows has basically tabletified a desktop UI, but if that’s the underlying architecture, I don’t see the value in burying some critical desktop PC related functions. It took me ages to find the Power options–formerly in the classic Windows Start menu–that would allow me to restart the device (necessary for some setup and maintenance tasks). It took me a while to track down the old My Computer (now called “This PC”) root, as well, and although I’ve found the Command Console, I still can’t find the Run prompt (or its Windows 8 corollary) to quickly call up network locations. With the right mental model in place, a lot of my above complaints would be made moot. If the Surface is to be a tablet–even a high-powered one–there are advantages to reducing the complexity of actions I need to take, and levels I need to traverse, in order to perform basic functions. Not to sound like an Apple fan-boy, but as a case-in-point, when I need to connect a new Bluetooth device to our iPad, I hit Settings, turn on Bluetooth (if not already on), and select the item from a list. To do the same on the Surface, I have to go to a screen where I can see the taskbar, touch a tiny arrow icon to show a pop-up icon grid, select the tiny Bluetooth icon which takes me to an apparently unrelated screen, select PC and Devices from a sidebar menu, select Bluetooth from the next sidebar menu, turn on Bluetooth (if not already on), select the device from a menu, and choose to pair. Phew! The Surface is heavy. It’s still ten times lighter than the old Toshiba Tecra M7 tablet PC I’d been using as my portable comic-making tool of choice, and certainly more compact, but for its size, geez, it’s a big-boned little thing. Partially due to the weight, partially due to the shape and thickness, and partially because I need access to the keyboard (largely for the Undo shortcut) while drawing, I have yet to find a really satisfying way to hold the thing. On a tabletop, the angle is too steep, and in my hands, it’s uncomfortably awkward. Many of my problems would be solved if I could find a way to stick an Undo icon on the taskbar somehow. Speaking of size, as handy as the compact size of the tablet is, it’s not ideal for making nice broad sweeping brush strokes, or keeping parts of a drawing in perspective with other things you can’t see off-screen. Not Microsoft’s fault, and a problem with using most any small-size device for art. App-wise, not everybody is on board yet, and I don’t know who all is to blame–Microsoft or the third party vendors of the offending software. I’m an avid Google ecosystem user, so I prefer Chrome and like to have ready access to my Google Drive. The first time I installed and loaded up Chrome, I found it strangely blurry on this super high-res display. I did some searching around and finally found that there’s a relatively obscure checkbox in the Windows preferences you have to hit to make it show up crisp and clear (something to do with the OS auto-scaling things). That’s great, but now everything in Chrome is ultra-tiny. Even smaller than the regular Windows 8 Surface tidbits. Photoshop had similar problems, and on top of that (not surprisingly) desktop Photoshop is just not designed with a tablet use case in mind. It’s painful, at times, to needle around with these itty-bitty little controls and menus. I had to roll up my sleeves and get dirty to get things the way I wanted them. 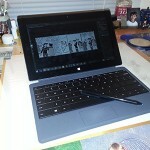 The Surface leverages Wacom digitizer technology (yay!) but I had to find, download, and install the driver on my own in order to get pressure sensitivity to work across the board (boo!). I have a disc copy of Manga Studio I still can’t get installed on the system because (to be expected) the Surface has no optical drive, Apple (boo again) doesn’t seem to let their SuperDrive play nicey-nice with non-Apple computers, and the software-only method I tried (converting the contents of the disc to an ISO file, Google Driving it to the Surface, and mounting it there) came up bupkis due to the ISO file somehow becoming corrupted in the process. Blergh. This is a real personal issue: The screen feels awfully slick under the stylus. I like a tad more drag. Maybe I just need to keep monkeying with the settings. I won’t call this a knock against Microsoft; it’s just an adjustment I need to make. I’ve saved the biggest gripe for last: This thing is hideously buggy. My first day of use, I put it to sleep by pressing the top power button, and couldn’t get it to wake back up. Not sure what I did to offend it, but eventually it decided to cooperate. I have to use VPN software to connect in to my day-job network, and it seems every time I disconnect from the network, Windows turns off the firewall settings I established to enable access. I have a Microsoft Wedge Mouse–a Bluetooth device–that (also when coming out of sleep) the Surface will claim is connected, but which won’t actually function until I toggle the Surface’s Bluetooth setting off and on again. The stylus goes all out of whack near the left edge, and particularly the top left corner, which, of course, is where important things like the File menu and toolbar are in apps like Photoshop. I couldn’t draw anything on the far left of the window–the line kept jumping away from the pen tip–so I had to drag in the side of the drawing window to keep it in the safe zone. Every day I seem to come up against more bugs and glitches, to the point I just can’t remember them all. This was all really disappointing. Although it’s bulky compared to other “pure” tablets, the size and weight make the Surface scads more portable than my laptop options. It’s a powerful little bruiser. It runs all the apps I’ve loaded on it so far without complaint, and has plenty of space for storage (although I store a lot in the cloud now, anyway). Hrmmm… Is that really all I can think of? I’ll add more if something occurs to me. All told, I really can’t see the Surface replacing my current comic-making and computing setup. Even if it had the kick-buttingest user interface, it would still be saddled with a tablet-sized display, and there’s nothing like a big broad drawing surface to help me feel empowered as a cartoonist. I can easily imagine a device like this–if done well–becoming my weapon of choice for mobile comicking. For basic emailing and other computing functions, the iPad and even my Samsung Note 2 still have attractions the Surface doesn’t beat, but I’d be willing to accept a little discomfort there if the art-making experience were better. A full-powered cartooning platform in a tablet would be a liberator of little moments when away from my home studio–something to help me actualize the cartooning potential of downtime over lunch or in the rare quiet moment while watching my kids. As it stands, the glitches and dissatisfying user interface design choices hamstring the advantages it should offer. I’m going to keep tooling around with it, and see if I can surmount more of my personal obstacles with time and familiarity, but for now, I’m just not confident it’s going to work out.